Article first appeared in the Wikimedia Finland blog. ← Osallistu Europeana Art History Challengeen! Thanks for the great write up, very interesting to read your story! You can read up on our efforts for migrating Freebase to Wikidata at http://bit.ly/freebase-to-wikidata-slides. Thank you Tom, I heard about that project and looked at the academic paper written about it. Great summary in the slides! Do you know anything of how the Freebase MIDs will live on in the Google Knowledge Graph. I saw that some are to be found there, as well as some new GIDs (Google ID?). Will these also be mapped to Wikidata? 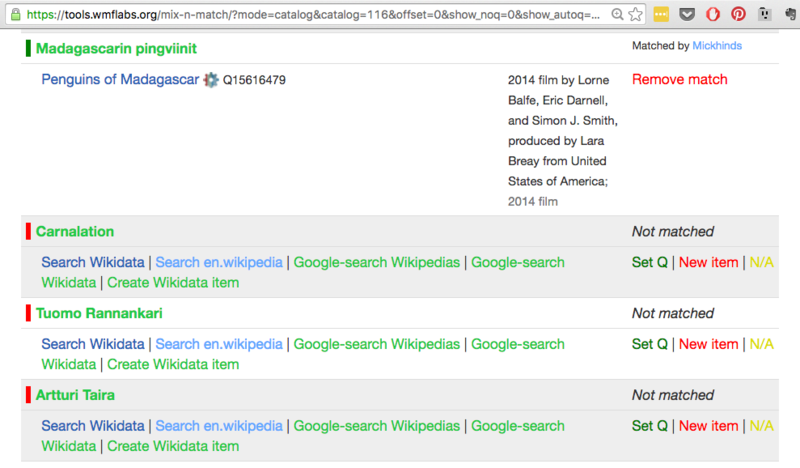 Within media use it would be really cool when we know the Wikidata-ID’s of our content to be able to also do Google Knowledge Graph queries of them, and maybe use the results for recommendations or facetts on topical pages. Freebase and Google Knowledge Graph identifiers have their fixed place in Wikidata, check https://www.wikidata.org/wiki/Property:P646 and https://www.wikidata.org/wiki/Property:P2671 respectively. As Tpt wrote, there is a mapping available: https://developers.google.com/freebase/data#freebase-wikidata-mappings. Hope this helps you achieve your goals. Excellent, thank you once more Thomas for the clarification and further info, much appreciated!